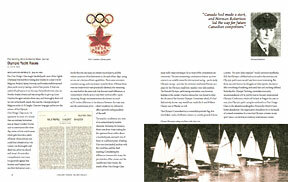 Canada’s Olympic Sailing Legacy is a unique record of Canada’s involvement in Olympic Sailing stretching back to 1924. 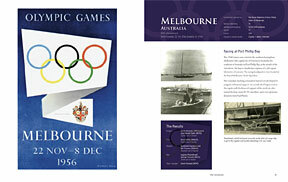 The author, Hugh Drake, was deeply involved in the 1984 Olympic team as the team manager for Terry McLaughlin and Evert Bastet who won a silver Medal that year. 1984 was Canada’s most successful Sailing Olympics with 3 medals in total (Bronze in the Soling and Finn Classes and Silver in the Flying Dutchman). In 2005, Hugh decided that Canadians needed to become more aware and proud of their sailing history and set out on a 5 year quest to gather material from all his friends and other past Olympians. He was joined in this adventure by Paul Henderson, himself an Olympian and past President of the International Sailing Federation (ISAF – governing body for the sport of sailing). 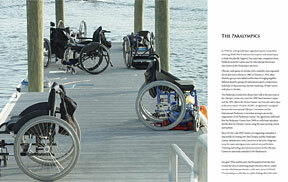 With Paul’s help and the help of many people across the country Hugh was able to put together a fantastic collection of photographs and stories about the Olympic and Paralympic experiences of Canadian athletes. The most unique section of the book includes stories and sage advice from all of Canada’s living medalists – what sailing has meant in their lives, how they overcame obstacles and accomplished their goals. This material is sure to inspire many generations of Canadian sailors to come. Wind Athletes Canada is selling these books on consignment to Sailing Clubs, Provincial Sailing Associations, CYA and online through the Sail Canada website. 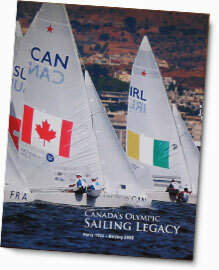 Sailing organizations that sell the book will retain the profits and use them for a variety of things such as to develop and maintain their Learn to Sail Programs, Club and Provincial Racing Programs, Hosting of Regattas, Coach Development and Training, Training of Regatta Officials and Canadian Sailing Team Programs. Wind Athletes has acquired the rights to Mr. Drake’s book and looks forward publishing updated editions as Canadians compete in future Olympic Games. If your sailing organization is interested in raising money for its programs, please contact us and order your books today. This beautifully designed, soft cover book that covers 19 Olympiads and 4 Paralympics, recollections from 10 Canadian Olympic medalists and profiles of the 23 Olympic Classes can be purchased online from the Canadian Yachting Magazine website.